When Skallops inventor, Marshall Grinstead was just eight years old, he had an idea for how to make a better playing card house using little pieces of clay with notches carved into them to keep the cards in place. Fifteen years later, with the help of two college pals who had just started their own toy company, Marshall turned his childhood daydream into a reality. Skallops are clever little clips that hold playing cards together in any shape you can imagine. 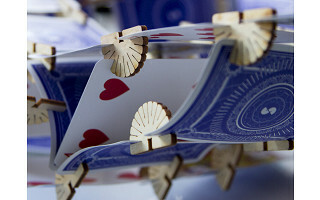 Laser cut, sanded and finished from high-quality birch plywood, Skallops let you turn an ordinary deck of cards into extraordinary structures. Silly hats, animal creations, floor-to-ceiling towers—you name it, you can build it out of cards with these handy little helpers at your fingertips. Each set includes 52 Skallops and a deck of custom playing cards. Download and follow easy step-by-step instructions to build dinosaurs, birds, geometric figures, hats, and more or create your own original cards of art. When Skallops inventor, Marshall Grinstead was just eight years old, he had an idea for how to make a better playing card house using little pieces of clay with notches carved into them to keep the cards in place. Fifteen years later, with the help of two college pals who had just started their own toy company, Marshall turned his childhood daydream into a reality. Skallops are clever little clips that hold playing cards together in any shape you can imagine. 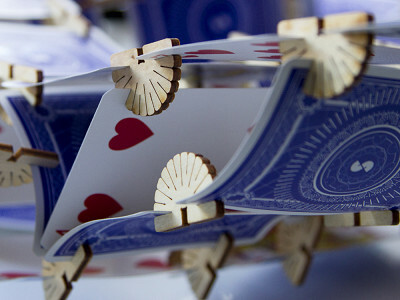 Laser cut, sanded and finished from high-quality birch plywood, Skallops let you turn an ordinary deck of cards into extraordinary structures. Silly hats, animal creations, floor-to-ceiling towers—you name it, you can build it out of cards with these handy little helpers at your fingertips.